TOKYO, May 28 (UPI) An Army radio station described for a gag today a ‘battle’ between American soldiers and a ‘twenty-foot sea monster’ in the streets of Tokyo. The description was so vivid that Gen. Douglas MacArthur was reported to have been fooled, as well as thousands of Americans and Britons. For more than three hours the telephones of Station WVTR [Radio Japan] and of Army agencies were clogged with telephone calls from Americans and Britons, some of whom were frankly frightened. According to a member of the station’s staff, one caller was General MacArthur. 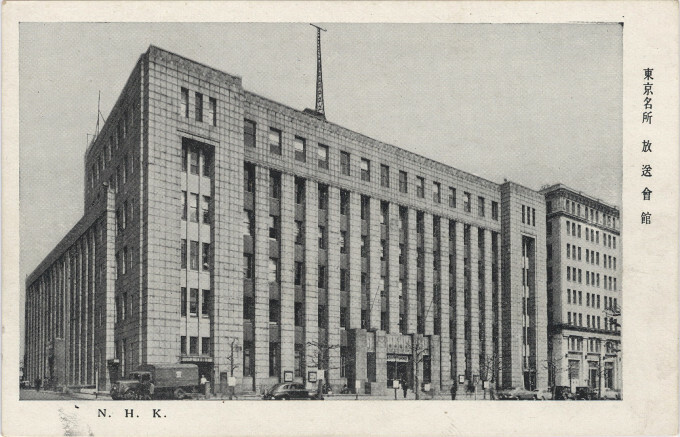 The Tokyo studios of NHK (Japan Broadcasting Corp.), c. 1948. During the Pacific War, broadcasts of “Tokyo Rose” and the Emperor’s surrender speech originated here. During the Occupation (1945-1952), American Forces Radio Service (AFRS) broadcast in English as WVTR Radio. It was from these studios, in 1947, where Gojira was “born”. “In 1947, I was serving in the United States Army, posted to the Army of Occupation in Japan. I was stationed at Shonan Tomioka, about 30 miles south of Yokohama, in a former Japanese seaplane base, which had been made into the Headquarters and Battalion Barracks for the 753rd AAA Gun Battalion. “… In the early evening, after a hot muggy day, at about 7:00 p.m., a group of my fellow soldiers and I were listening to a music program broadcast from the Armed Forces Radio Station, WVTR Tokyo. For the next three hours, until lights-out, we listened with fascination as the program was repeatedly interrupted by news flashes which eventually included on the scene ‘live’ reports with audio of the most amazing account of destruction, mayhem, gun fire, cannon shots, burning buildings, Army mobilization and an unknown ‘Beast from the Sea’, roaring in the background. “The first interruption occurred, as I said, about 7:00 p.m. with a report that some fishing boats were missing at sea, but near the coast, off a small fishing village south of Yokosuka on the western shore of Tokyo Bay. A short time later a report of a village destroyed in that area was given. Followed by phoned in reports from eye witnesses claiming to have seen a huge ‘sea monster’ moving inland and north up the coast. “So, with brief moments of music interrupted by news breaks, we were kept informed of a relentless beast, bent on destruction, moving north, up the coast toward Tokyo. With, eventually, Army Units called to the scene where they cornered the beast. Which they then proceeded to attack with cannon fire, rifles being ineffective. “The reports continued at a frantic pace, including harrowing rescues and escapes, remote radio links, movement of heavy-weapons and tanks and all of the stuff of which the truly epic stories are made -accompanied by the terrifying screams, roars and shrieks of both the beast and the panic stricken populace. As well as gun fire and bullhorns. ‘[But] the authors of this masterpiece made a serious mistake in all of their meticulous planning. It was reported later, by rumor, that the family of the commanding General of the Eighth Army, General Eichleburger, was vacationing at a resort that was in the northward path of the ‘Monster’. It was rumored that the General was not amused. General MacArthur was probably not amused either. “… The next day we waited for a final report, to no avail. All we ever heard, by the grapevine, was that a Sergeant and a Corporal had been arrested and relieved of duty at the radio station. 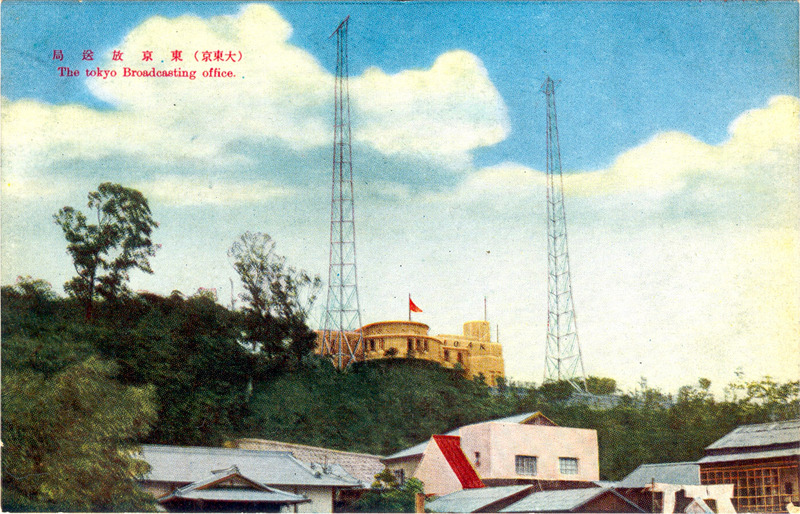 The Tokyo Broadcasting Office (Radio Japan) transmission towers, Atago Hill, Tokyo, c. 1940. “The Tokyo Broadcasting Hall is a six-story ferroconcrete structure with a basement. The CIE is mainly on the fifth and sixth floors. According to Miss Kurita, there are thirteen recording studios located on the north and west sides of the building. The east and south sides face streets, and the studios are located on the north and west sides to avoid street noise. Offices and workrooms occupy the sides of the building facing the street. “Walking down the marble steps about two ken wide to the fourth floor, we came to a room nest to the stairway with the sign “Sound Effects Center”. The door was open, and we could hear the conversation taking place inside.